Buy The Secret History of New Jersey from ﻿Amazon﻿ or Barnes & Noble. Check out my recent archival work for New York Public Radio. Sequel in Edison Literary Review and Your Daily Poem. A Day in the Life in Tiferet and Your Daily Poem. The Yankees of My Youth in Spitball. Which Way is Up in Your Daily Poem. Vulnerable in Your Daily Poem. America Achieved Along the New Jersey Turnpike in Your Daily Poem. First Class, Slow Children at Play, and Junior High School on Verse-Virtual. Assimilation in the Fall 2014 Edison Literary Review. Joy to the World and Statistically Insignificant in Mas Tequila Review, edited by Richard Vargas! Order one of the best journals in the U.S. now! An article about my return to academic life at Rutgers from the Home News Tribune. And another article on the Rutgers Focus site. Check out this interview of me at A Long Story Short. Shipwrecked in pretty awesome company (but used without permission) on the Curious Words website. Migration of the Butterfly Tattoo used as a classroom prompt! Einstein’s Geese featured on Your Daily Poem! Pat Turner Kavanaugh’s review in The Star-Ledger. John J. Petrolino III’s review in Word Riot. 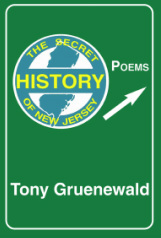 Visit the pages to find out about Tony Gruenewald, his poems, and his readings.